Along with the new Nikon D90 comes the kit lens for the D90, the AF-S DX NIKKOR 18-105mm f/3.5-5.6G ED VR, which by all standards appears to be the ultimate kit lens at first blush. TOKYO – Nikon Corporation is pleased to announce the introduction of the AF-S DX NIKKOR 18-105mm f/3.5-5.6G ED VR, a new DX-NIKKOR zoom lens with built-in Silent Wave Motor and Vibration Reduction. This compact and affordable 5.8x zoom NIKKOR lens offers remarkable versatility and covers a broad focal range of 18 to 105mm. When mounted on any DX-format Nikon digital SLR camera, the picture angle is equivalent to that produced by a 27 to 157.5mm focal length lens on a 35mm-format film camera or Nikon FX-format camera. An ultra-compact Silent Wave Motor (SWM) built into the lens body ensures fast, quiet and accurate autofocus operation and complements the compact design for superb handling. Nikon’s VR (Vibration Reduction) function, specifically engineered for each NIKKOR lens, gives photographers the ability to shoot handheld at shutter speeds up to three stops* slower than would otherwise be possible, thereby minimizing image blur caused by camera shake and delivering dramatically sharper pictures, especially in low-light conditions such as in interiors and at twilight. The VR function also stabilizes the camera’s viewfinder image, making composition easier and more comfortable. This new high-power zoom lens is the latest addition to the DX-NIKKOR lens lineup, offering photographers a convenient single-lens solution to a broad range of photographic needs, ranging from wide-angle landscapes and interiors to portraiture and medium-range sports. Featuring a newly designed optical system with an ED glass element along with an advanced aspherical lens element, the AF-S DX NIKKOR 18-105mm f/3.5-5.6G ED VR provides excellent image reproduction capability, delivering high-resolution, high-contrast images while minimizing chromatic aberration. The rounded diaphragm opening makes out-of-focus elements appear more natural while Nikon’s Super Integrated Coating ensures outstanding color balance and reproduction while greatly reducing ghosting and flare. *As determined by Nikon performance tests; shutter speed that causes image blur varies according to each photographer’s skill and shooting conditions. 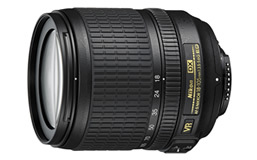 Note: DX-NIKKOR lenses are engineered and optimized for use on Nikon DX-format and FX-format digital SLR cameras. When mounted on an FX-format digital SLR, the camera’s DX-Crop Mode is automatically engaged, altering the image capture area accordingly. DX-NIKKOR lenses are not compatible with 35mm  or IX240 [APS] format film cameras.